For decades parasites were the pariahs of science. Only recently have biologists begun to appreciate that these diverse and complex organisms are the most highly evolved life forms on earth. In this work, Carl Zimmer takes the reader on a tour of the strange and bizzare world that parasites inhabit, and recounts the voyages of these wonders of creation. Parasites can: rewrite DNA; rewire the brain; genetically engineer viruses as weapons; and turn healthy hosts into the living dead. This book follows researchers in parasitology as they attempt to penetrate the mysteries of these omnipotent creatures who control evolution, ecxosystems, and perhaps the future of the human race. Susan Adams Forbes Zimmer is such an accomplished, vivid writer that he is able to weave these revolting beasts into an engrossing story that you will read to the last page. Mark Ridley The New Scientist A nonstop delight...Zimmer is a colorful writer, and takes full advantage of the macabre natural history of parasites. 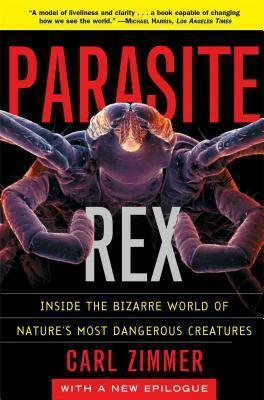 Kevin Padian The New York Times With Parasite Rex, Zimmer proves himself as fine a science essayist as we have. Michael Harris Los Angeles Times A model of liveliness and clarity...a book capable of changing how we see the world. Carl Zimmer is a senior editor at DISCOVER magazine. He is the recipient of numerous awards, including the Everett Clark Award for science journalism in 1994 and the American Institute of Biological Sciences Media Award in 1997.